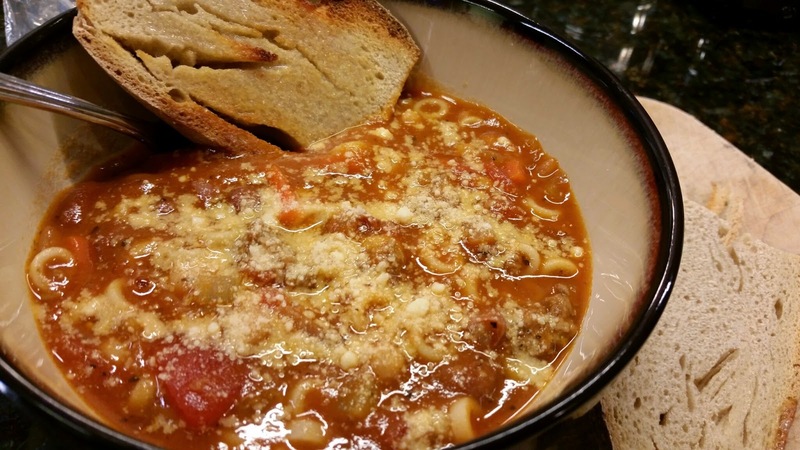 We've always loved Olive Garden's Paste e Fagioli Soup, and it was a happy day when my friend Peggy found a copycat recipe that tastes almost exactly like Olive Garden's. I have modified it slightly by only using 1/2 lb. ground beef, cutting the pasta way down, and adding a bit more liquid. Begin browning ground beef in 6-quart pan over medium heat. Add onion, garlic, carrot, and celery and continue cooking until beef is browned. Drain fat if necessary. Add all remaining ingredients, except pasta; cover and simmer for 1 hour, stirring occasionally. Cook pasta in boiling water over high heat, just until it is al dente. Drain. In the past I have used the V8 that the recipe calls for, but V8 is not something that I usually buy or have on hand. So, this last time I made it I substituted a can of vegetable broth and an additional 8-oz. can of tomato sauce, and it turned out great. I also didn't have the exact pasta so I used Creamette Rings instead. I warmed this up several times - yay for leftovers! - and added a bit of water each time, just to keep the consistency right. Some soups I love as they get thicker and thicker each time they're reheated, but I'd rather not let this one thicken up too much. This is also a good reason not to use too much pasta. The original recipe called for 8 oz. of pasta, and that is fine the first day, but as the soup sits the pasta soaks up the liquid, and pretty soon you have something more like goulash. 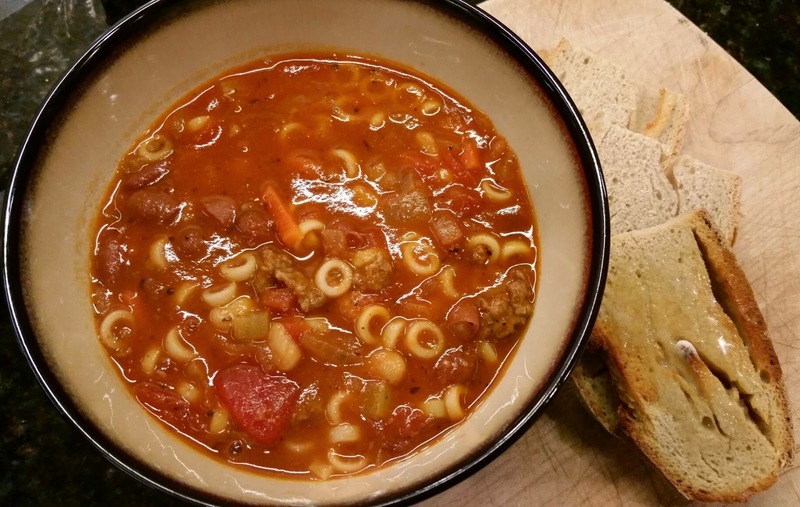 If you like the Paste e Fagioli Soup from Olive Garden, you'll definitely want to give this recipe a try. So yummy! Sprinkle with some Parmesan, serve with some crusty bread, and enjoy.